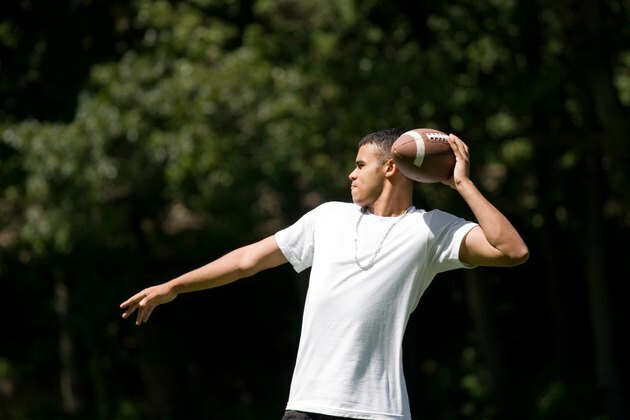 Whether you are gearing up for the beginning of the season or prepping for the big game against your rivals, football drills are often used to prepare the mind and body for the game. Since football is such an interactive game, practice drills generally involve the whole team or several players working together. Although you cannot fully prepare yourself for the sport without a partner or two, you can still practice throwing, catching, speed and agility drills on your own. Set up a target in an open space, such as a large backyard or park. Since you do not have someone to catch the ball for you, your target will determine how accurate your throw is. You might use colored tape to make an X on the ground or a wall. Throw the ball from 10 to 15 yards away from your target. If the ball reaches your target, your throw is accurate and you should continue practicing with the same throwing mechanics. If the football did not reach the target, make small modifications to your throwing technique until you achieve accuracy. Increase your distance by 5 yards once you can accurately hit your target with five consecutive throws. Enhance the difficulty of the football drill by simulating game activity as you throw the ball. Attempt to throw the ball while running forward and backward and shuffling sideways. Stand with your feet shoulder-width apart, knees slightly bent. Hold the football in your hands in front of your chest. Throw the ball several feet into the air, watching it carefully as it moves through the air. Catch the ball as it falls back toward the ground. As you catch it, tuck it into your body as though you were preparing to run with it. Increase the vertical height of the throw gradually. As you become more familiar with the drill, make it more difficult by throwing the ball up and away from you. This technique requires you to run for the ball, which further helps prepare you for a football game. Position two cones roughly 10 to 20 yards apart. Beginning at one cone, sprint in a straight line toward the other cone. Just before you reach the second cone, veer off to the left at approximately a 45-degree angle. Repeat the drill, this time veering off to the right. Set up four cones in a Z-shape. Each cone should be approximately 5 to 15 yards apart. Sprint quickly from one cone to the next. Arrange 5 to 10 cones in a vertical line, approximately 5 yards apart. Use the side shuffle to weave your way back and forth through the cones. To complete the side shuffle, stand with your feet slightly wider than shoulder width. To move toward the right, your left foot should slide toward the right as right foot steps to the right. Continue shuffling along in this same manner. To move to the left, simply reverse the process.